It is the yellowish root that contains the active alkaloids; the root bark is shaved and eaten directly or as a powder drank in an infusion. The bwiti cult and other secret tribes use Iboga throughout Gabon and the Congo, it has been referred to as the tree of knowledge. They believe the use of the plant to help resist the loss of their traditional tribal life, individuality and to prevent the influence of western civilization. In traditional ceremonies one cannot enter the cult until one has seen bwiti and this is only done with the use of iboga. Traditionally it is consumed first in small doses building up to a large dose. They believe the use of iboga to bring them to speak with their ancestors and to the realms of the dead. Cult Shamans use the Iboga Root Bark to seek information from the spiritual world and they may consume this for a full day before asking advice from the ancestors. In the west, Ibogaine first became known during the 1960's, when the drug-scene was always open for new things to try. Interestingly enough, this drug soon got the reputation to be able to cure addictions. This was accidently discovered by H. Lotsof, a New York film-student and heroin addict. In 1962, he took a dose of ibogaine and discovered it alleviated all the withdrawal symptoms of his heroin addiction. It has been found as an effective NMDA interrupter as it interrupts the receptor, which becomes addicted to substances such as heroin, cocaine, ketamine, nicotine, alcohol and many other drugs. It seems to be a very promising power that is in this plant. Tabernanthe iboga, is a plant that grows wild in forests around Africa. The Australian relative is in the closely related genus Tabernaemontana, which also grows in many other countries, especially Tabernaemontana orientalis. "As with other hallucinogens, especially Teonanacatl and Ololiuqui, the active principles of Tabernanthie Iboga belong to the large class of indole alkaloids. Ibogaine, which can be produced synthetically, is the main alkaloid of Iboga. Its hallucinogenic effects are accompanied by strong stimulation of the central nervous system." Vastly reduces withdrawal pains and cravings from heroin, methadone, alcohol and cocaine, may do the same with other drugs. The clinical dosage for the root bark is 16-45 grams. The known clinical dosage of Ibogaine being administered in treatment centers ranges from 10-20mg/Kg bodyweight to 250mg- 2g in extreme cases of addiction. IBOGA SHOULD NOT BE USED WITH ANY OTHER SUBSTANCE UNDER ANY CIRCUMSTANCES. When using iboga it is pertinent that a caregiver and/or medical supervision always be present until the experience is over. Much research has been done with using Ibogaine (The active alkaloid in Iboga) for drug addiction therapy. The results have been spectacular with about a 90% success rate when taken in one high dose by an opiate or even alcohol addict it drastically reduces the withdrawal symptoms and gives the patent an insight with clear visions into his or her own life, revealing the personal cause of the addiction. This in turn enables the patient to go for months without a relapse. I know this Iboga rootbark for many years now. I order each year from you guys. You where the first 10 years ago with this excellent quality bark from 9 year old trees. This rootbark is from sustainable plantations which have been grown by a family for decades. This rootbark has good activity and comes with the full iboga.org guarantee. 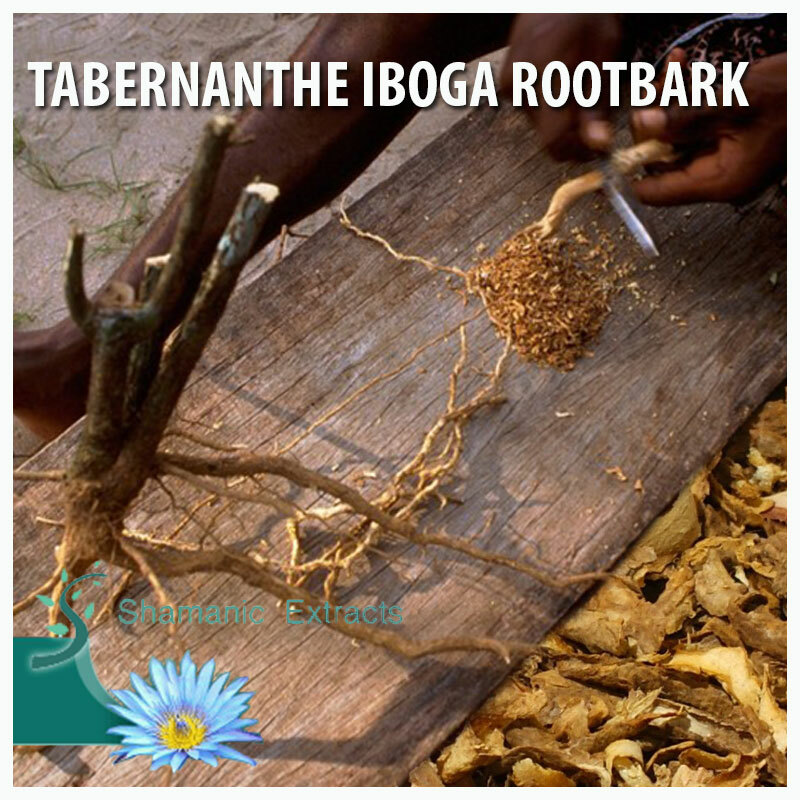 Share your experience about TABERNANTHE IBOGA ROOTBARK with other customers. Submit your tips or thought on this product, be detailed and specific.